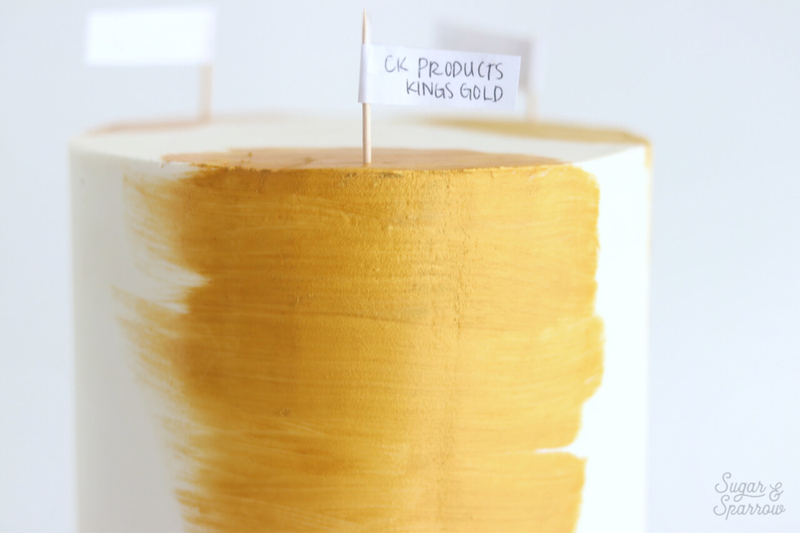 For years, I’ve been seeing my Instagram caker friends post photos of metallic gold buttercream cakes. Like, really shiny ones. After doing a bit of research into how to get the look, I decided to order the Rolkem Super Gold luster dust and try my hand at it. 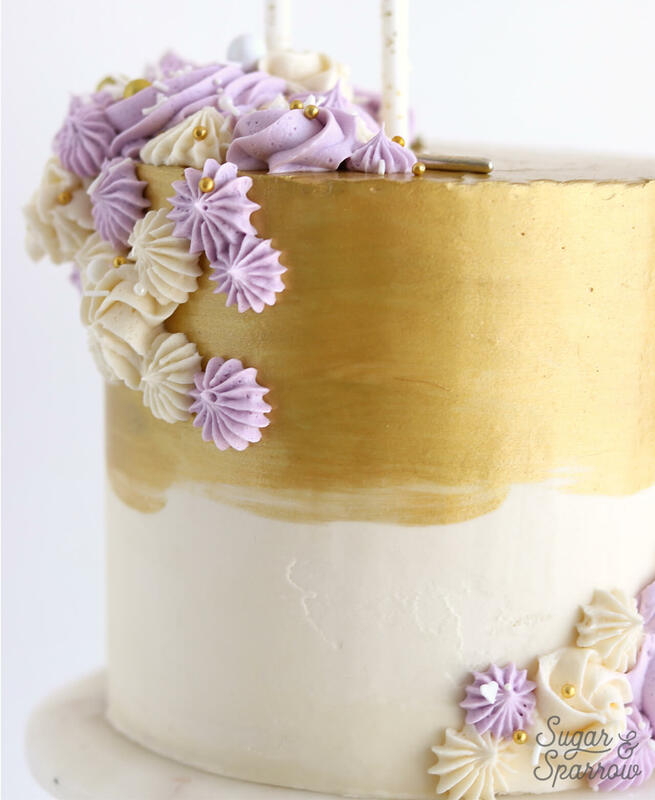 I’ve seen a lot of cake makers use that mixed with a little vodka to paint their buttercream cakes for a flawless metallic look. Here’s the thing though, while I was absolutely blown away by the shiny gold finish, I realized that there has been a recall on Rolkem Super Gold because (the batch I ordered at least) contains high levels of copper, which is not the healthiest for consumption. It’s FDA approved in some countries, but not the USA, so I wondered if after swooning over this amazing gold finish I could actually find a comparable option that is FDA approved worldwide. Disclaimer: this post does contain some affiliate links, meaning I may receive a small commission if you click them and purchase items I’ve recommended. Using these links won’t cost you any extra money, but they do help to keep Sugar & Sparrow up and running. Thank you for your support! First, to avoid messing up your final coat of buttercream, you must start with a well-chilled cake. After applying my final coat of buttercream, I place the cake in the refrigerator for a good 30 minutes or more, until the finish is hard to the touch. Second, you need a good brush that won’t leave a ton of bristles in your paint job. This brush by Innovative Sugarworks is a great one, made specifically for cake decorating so you can rest assured that the bristles are made from high quality synthetic fibers and are safe for use with food. Your local craft store might have good brushes, but make sure they’re made with the right bristle fiber because a lot of paint brushes are made with animal hair. After all, the last thing you want is horse hair ending up on your cake! And finally, you’ll need the right consistency of edible paint to get the look you’re going for and the best mixing solution to help the finish dry quickly. When working with luster dusts, you’ll need an alcohol solution to mix with so the liquid evaporates after you paint with it. Some cakers prefer vodka, but I always use grain alcohol to mix luster dusts with. Grain alcohol can be found at your local liquor store (it’s also known as Everclear), and at 180 proof it has the highest alcohol content of any alcohol. The higher the alcohol content, the faster it will evaporate from your cake and leave you with that shiny gold finish you’re pining for. If you only have vodka or lemon extract on hand, those will work as well, they’ll just take longer to dry. To my amazement, I ended up really liking all three of the products I tried for metallic finishes. There was one that stood out above the rest (read all about it below!) for color and ease of use, but all three will work depending on the color you need. Be sure to watch this video to see them all in action. Spoiler alert: this one was my absolute favorite of the three products I used. It comes in a bottle pre-mixed with the right amount of alcohol solution, so you don’t even have to worry about making that extra trip to the liquor store. Edible Art Paints come in all sorts of colors, metallic and non-metallic, and the Glamorous Gold was the perfect shimmery gold color I was after. The finish dried in about ten minutes and I found that one coat was sufficient for applying to the cake. I was worried about it looking streaky, but after the first coat dried, it ended up looking really uniform. My reasoning for the lower rating is mainly because of the color and the semi-streakiness. King’s Gold was a bit vibrant for my liking, but they do make some other metallics that I would be interested in trying (there’s a Shiny Gold that looks a bit more like the color I was after). After painting a second coat, the streaks are diminished. 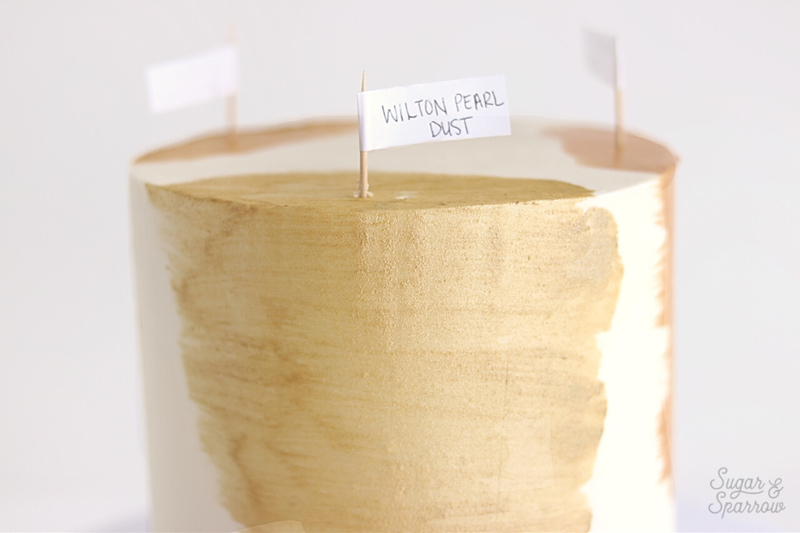 The best thing about Gold Pearl Dust by Wilton is that it’s more commonly found at your local craft store. It’s a luster dust that you’ll need to mix with an alcohol solution to make it paintable, but I found that the dust didn’t dissolve as well as other luster dusts I’ve used, making it a little more grainy of a finish. The color was also more of a champagne gold, and to my knowledge it’s the only gold metallic color option available from Wilton. If that’s the color you’re going for though, I’d totally recommend trying it. The finish ended up being shiny after two coats, although still a little streaky. If you’re looking for the best metallic buttercream finish that’s FDA approved and edible, I would definitely recommend any of these three, my favorite being Edible Art Paint. Remember that any time you paint on buttercream, make sure you start with a well-chilled cake that’s firm to the touch. Let me know if you end up trying any of these recommendations in the comments below, or if you know of other FDA approved solutions that work well! This post is super helpful! I do have a question though. Did you paint on ABC or SMBC? I tried edible art for the first time last week on SMBC and found it To be streaky. I ended up using two coats and never got a uniform code I was looking for. Hi Chassidy! I haven’t ever tried painting SMBC, I always use American buttercream and loved the way the Edible Art Paint turned out after painting with it. 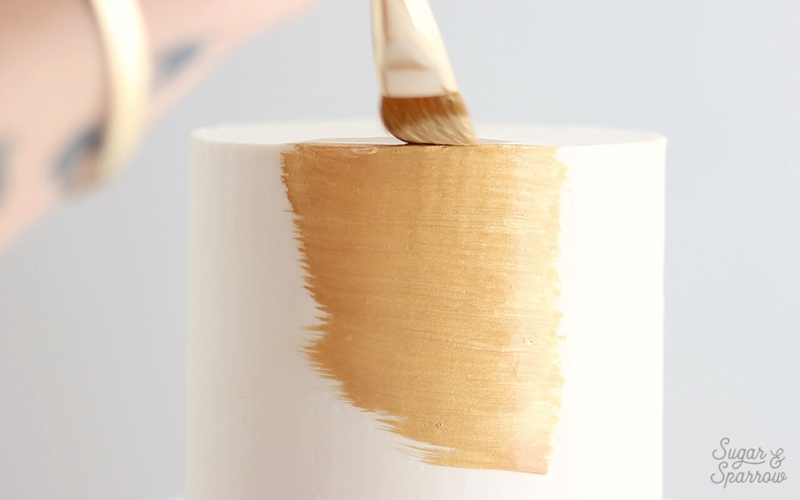 Did you chill your buttercream before painting? 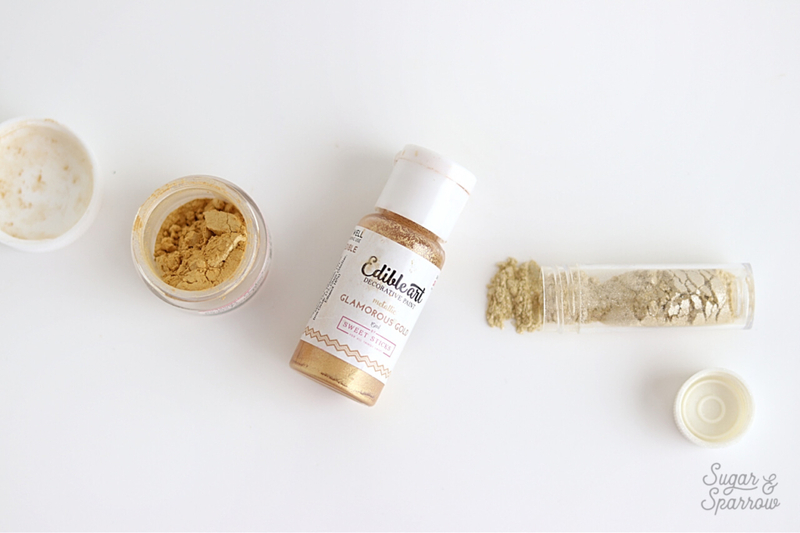 I am not sure if a luster dust mixed with alcohol would be a better choice for SMBC or not since I’ve never tried the technique on that kind of buttercream. Hi! This was extremely helpful and thank you. I found the Edible Art paint at a local cake decorating store. One question I have is, do you place it in the one of those clear dishes first? What’s the best way so not to waste any? With the luster dust you can always put back in the jar. Thoughts? Hi Teisha! 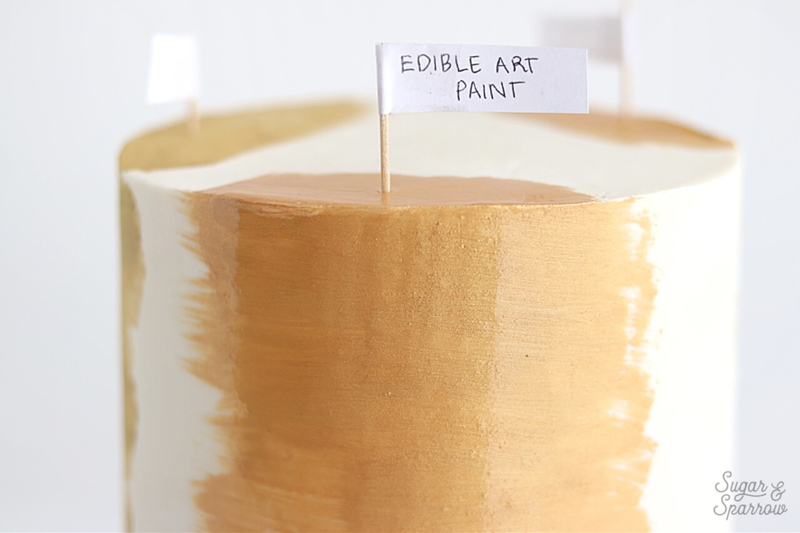 That’s so awesome you found Edible Art Paint locally – I’m jealous! Whenever I use Edible Art Paint, I just eyeball it to see how much I think I’m going to need and put squirt it into a bowl to dip my paintbrush in. If there’s any left over, you can always unscrew the cap and pour it back into the container. Hi Clare! I usually put the cake back in the fridge after painting for about 15 minutes (so the paint can dry) before continuing with the decorating process. This was so very helpful. I purchased the Rose Gold and it is my first time using cake paint. I am doing a 2 layer 6″ cake. Is one 0.5 oz bottle enough to do the top half? Hi Kimberley! 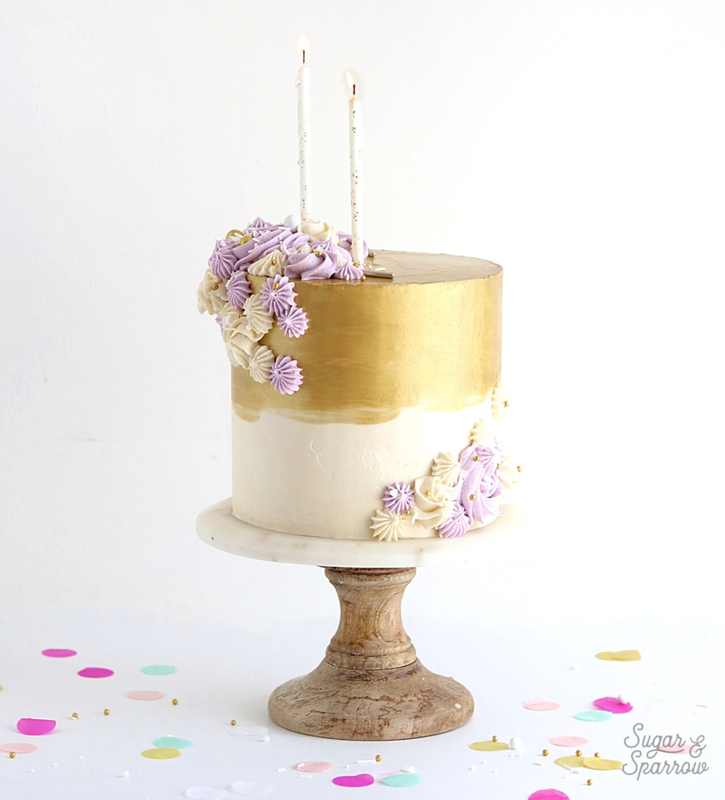 I love the Rose Gold color so much – that will look amazing on a cake! And yes, that should be more than enough. You’ll probably only need a third of the bottle or less. Loved your post and the video! I was wondering if you have tried this experiment with silver? 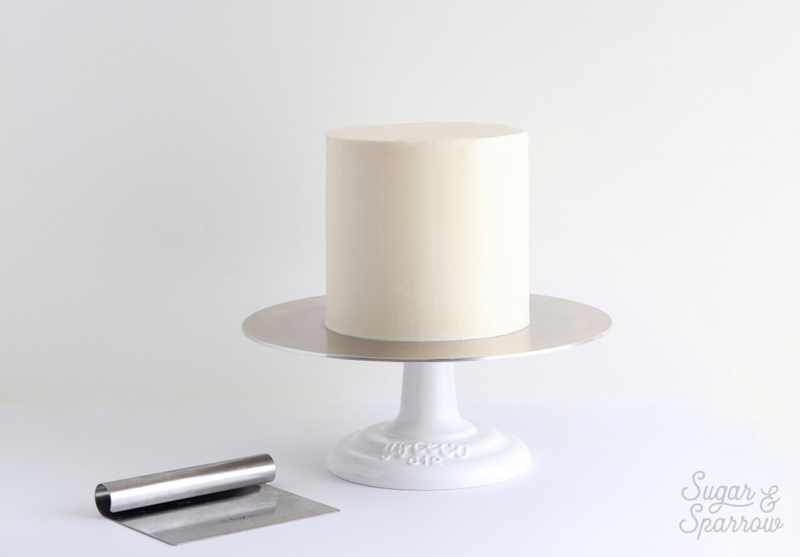 Do you have a favorite silver that’s FDA approved and great for painting on American Buttercream? Thanks so much, Summer! Although I have not tried this experiment with silver, I am so confident in Edible Art Paint’s metallic collection that I’m sure they have options for great FDA approved silver paint. Here’s a link to their silver: https://amzn.to/2tVdcM1 and they also have a “Light Silver” if you’re looking for a lighter option and “Gun Metal Grey” if you’re looking for a darker option. Thanks for taking this on! What would you suggest for a cupcake, since the surface is piped and cant be painted with a brush? Have you tried the spray method and would you recommend it? Hi Luciana! I’ve never tried the spray method before, but it’s definitely worth a try. For a cupcake, I would refrigerate the finished cupcake for about 20 minutes so the buttercream firms up, then paint on the Edible Art Paint. That would be my go-to method for a gold-finished cupcake, but like I said, the spray method may be a good way to go.